Let’s be honest: Yours isn’t the only dealership in town where local buyers can find good deals on used Hondas and Toyotas. You’re competing with other used car sales professionals, and it’s imperative for you to stand out from the competition. You probably can’t do that with inventory, but you can do it with customer experience. To make that happen, your sales team really needs to be on point. 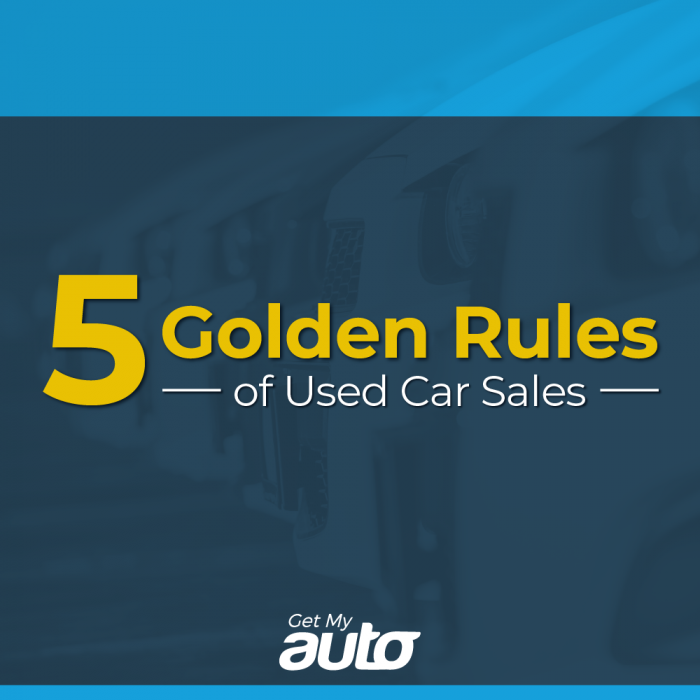 Start by refreshing them on these five fundamentals—the golden rules of used car sales success. When buyers approach you with questions about a specific automobile, they want to see that you have the necessary subject-matter expertise to answer them promptly and plainly. Now, you probably have too many vehicles on the lot for sales reps to have every detail down pat—but they should at least have enough baseline automotive knowledge to handle some basics, and they should know who to ask when they are stumped. Always put yourself in the buyer’s shoes, and provide the kinds of value they want. The young mom with three kids in tow doesn’t care about sports cars or top speed; she wants something safe, spacious, and affordable. Always tailor your pitch to the person you’re pitching to! Or, just remember that other Golden Rule: Do unto others as you would have them do unto you! Learn people’s names, and use them. Don’t ever argue with a customer. And if there is a service issue, work to get it resolved completely. The goodwill of your buyers is a precious commodity, and it’s ultimately what’s going to lead to further sales and referrals. Nurture it. Don’t squander it. When someone walks into your showroom, make sure they are warmly greeted. Ask for their name, and inquire as to what kind of car they’d like to see. Don’t be pushy, but do guide the conversation toward cars, and ultimately toward sales. Remember that your first few minutes with a buyer are utterly make-or-break. You obviously want to make sales, but you may not end every encounter with a conversion—and that’s okay! Work on building trust, not pushing decisions. Remember that some buyers just need to take some time to think things through, or to do a little more online research. Whether your team is made up of sales veterans or relative neophytes, it’s always helpful to review these fundamentals. Use them to guide your auto dealership toward even greater success—and with further dealership needs, reach out to Get My Auto directly.